Whenever I have a big decision and ask my Granddad for advice on the matter he will always say the same thing ‘make a list of pros and cons’. My Granddad is incredibly wise you see, and in his wisdom he knows not to give concrete advice and to remain objective so that I can come to my own decisions. 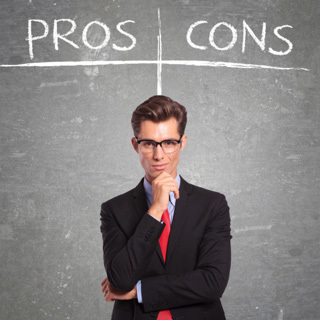 The pros and cons list is the perfect solution for the objective and analytical minds, because it allows you to get all the facts in one place and then make a measured decision based on those facts. To get started all you’ll need is a pen and paper, and a line drawn down the middle so that you can designate one side as ‘pros’ and the other as ‘cons’. Most likely you’ll also want to write the subject or question at the top. Now all you’re going to do is to write points as a list in each column and then see which one is longer to make your decision. The first thing you need to be careful of when doing this is that every point will not necessarily be the same. For instance, if you were to make a list of pros and cons about moving to another country the pros might be the sunny weather, the lower cost of living and the adventure, but the single con of ‘missing your friends and family’ could be much more meaningful to you. In other words, one con could be worth twenty other pros or vice versa. One way around this problem then is to give each point a weighting – next to each item put a score out of ten, and that way when you get to the end you can add these up to create an overall score that should tell you which option is the more appealing. One other thing that makes the ‘pros and cons’ list difficult to work with is the fact that it’s hard to be completely objective and take a step back. You may well find that you currently value one element much more than the others due to your particular mood or the events that you’ve recently lived through. If you talk this through with someone, you’ll find that they can help you to take a step back and help you remember the things you’ve said in the past, or what the implications of each point might be. This is still your decision, but if you want to be as objective as possible then this is something that can help a lot. Using the example of relocating abroad, you would be likely to see items such as ‘expensive’ or ‘will miss friends’ on the list. If you’re trying to get a feel for the reality of the situation, then you’ll probably find that these points aren’t really specific enough to carry much weight. Instead, try to be more specific by listing actually how much money it would cost you to move abroad, and who you would miss on a regular basis. This way when you look at the list you’ll be far more likely to get a stronger feeling for which option is the least offensive and what each would actually entail. Once you’ve done all this you should come up with a clear winner and your decision should be made, but when that winner is revealed to you you’re likely to find yourself with an emotional gut response as you feel pleased and relieved, or conversely disappointed and stressed. When this happens it tells you that you had probably already made up your mind regarding what you want to do at least unconsciously, and no matter how convincing your list is you should go with that feeling once it’s revealed to you. Sometimes the biggest benefit of an exercise like this is simply to reveal to you what you knew deep down all along.